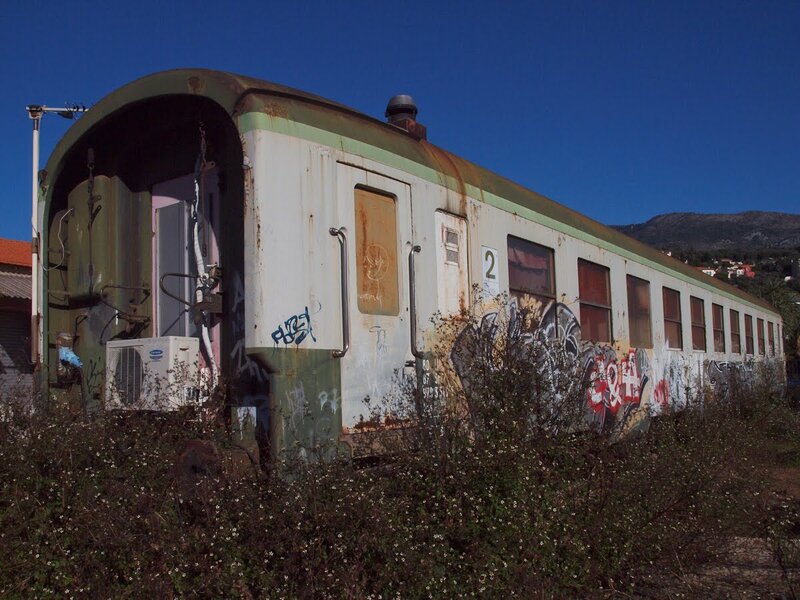 For as long as I can remember there's been an disused railway carriage standing alongside Menton's railway station. Each year the rust gets thicker, the wild flowers prosper and the dogs use the railways lines as their lavatory. Pour autant que je me souvienne, il y a toujours eu un wagon de chemin de fer désaffecté sur un côté de la gare de Menton. Chaque année, la rouille s'épaissit, les fleurs sauvages prospèrent et les chiens se servent les voies de chemins de fer en guise de toilettes. A piece of modern art, in its design. You make me discover something! I have to go and see that! Great detail shot, very well composed. Is this also a favorite spot for graffiti "artists"? 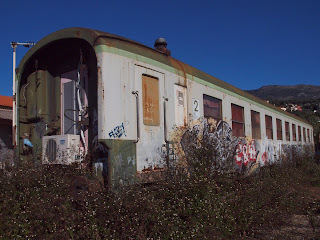 Nathalie, the train, as you see, is covered in graffiti but I'd not say by graffiti artists. We just don't have that in Menton, only awful tags and mostly at the base of the Old Town which is so disfiguring and awful. intriguing photo, love the daisies. Wow - a railway picture at last. I knew there'd be one eventually if I checked in every day. Next job is to move onto the platforms and take a couple of train shots! Be brave - you can do it! Well you found a way to make the ordinary......extraordinary. Lovely J. Nice photo. Brings a whiff of nostalgia, too. I wonder, though, why there is an air-conditioning device at the rear end of the carriage. 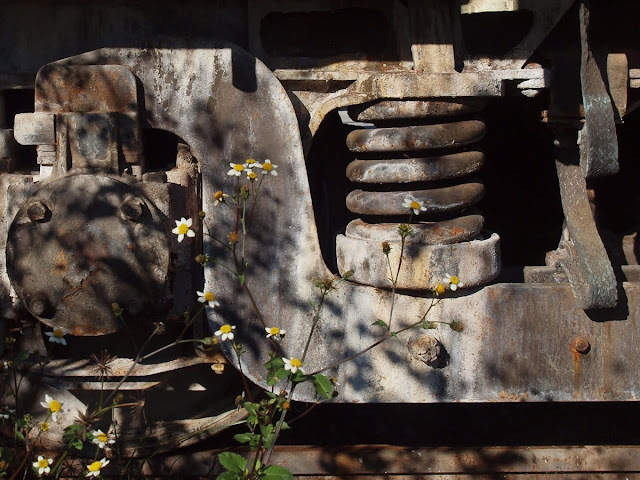 Your photo makes it look like a piece of public art, although no doubt others call it "junk" and "a disgrace." It is in the eye of the beholder, I suppose. And you, dear Jilly, turn it into art. I don't know why I love rusted old things, but I do! What a wonderful shot. I don't love taggers, though. I'm with you on that. Maybe someone lives in it?? Why else should there be air condition?